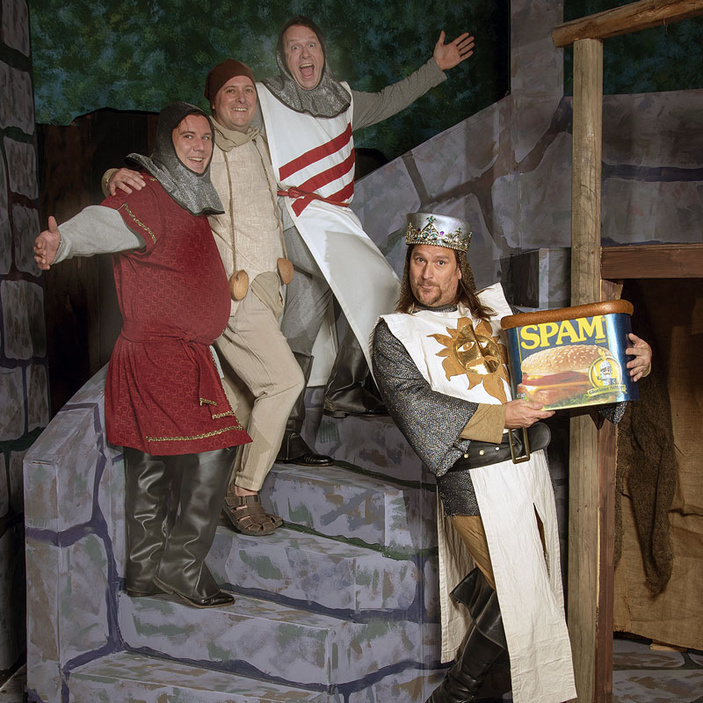 “Monty-Python’s Spamalot” clippety-clops its way to the stage in Fredericksburg on Feb. 15. The Fredericksburg Theater Company is celebrating with an opening night gala starting at 6:30 p.m. Friday in the lobby of the Steve W. Shepherd Theater, 1668 U.S. 87 South. The performance begins at 7:30 p.m. and continues at that time Fridays and Saturdays as well as 2 p.m. Sundays through March 3. Enjoy food and beverages along with live music opening night before the show, all included in the price of admission. The Tony Award-winning production parodies the legend of King Arthur and his band of haphazard knights as they sing and dance their way through an inane divine quest: the search for the Holy Grail. Along the way, Arthur and his men must evade beautiful showgirls, obnoxious Frenchmen, a death-defying limbless knight, and a killer rabbit. Cast in the production are Daniel Melton as King Arthur, James Lacy as Patsy, Ryan Bailey as Sir Robin, Barry Sikes as Sir Lancelot, Casey Cowan as Sir Galahad, Steuart Dewar as Sir Bedevere and The Historian, and Sarah Spillman as The Lady of the Lake. Playing multiple roles are Justin Elliot, Helena McFarland, Tommie Bailey, Prari Blair, Lucinda Harvey, Faith Kasukonis, Addison Powers, Holly Robinson, Daniel Hofmann, Luke Cummings, Warren Schlechte, Miles Fluitt, and Ron Rickerhauser. Behind the curtain are director and scene designer Jim Weisman, musical director Rhonda Behrends, and choreographer Heidi Melton. Ryan Bailey serves as the lighting designer, while Tommie Bailey designs the costumes. Weisman promises a spectacularly funny production. Tickets are on sale now. Admission is $29 for adults and $12 for ages 17 and younger. Box office hours are 9 a.m.-1 p.m. Monday-Friday. Tickets may be purchased at fredericksburgtheater.org or by calling the box office at (888) 669-7114.